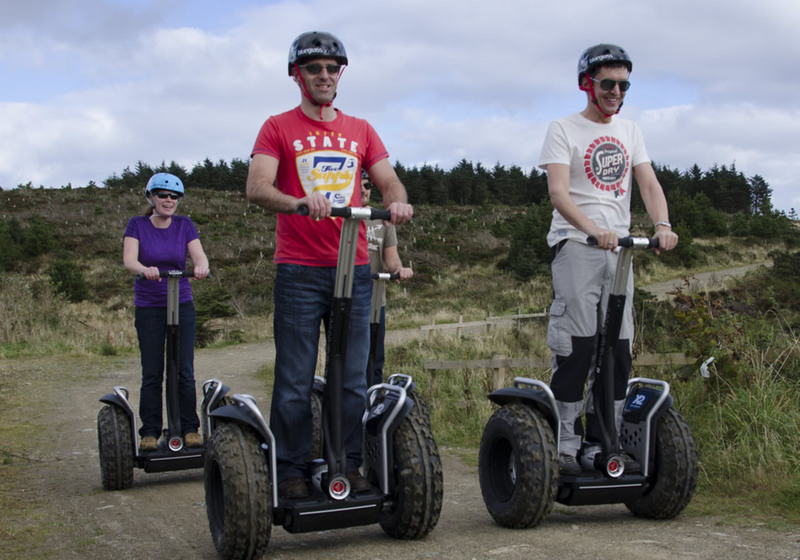 Our Segway Rodeo offers a truly unique & exciting team building experience for teams of between 12 and 30 people, suitable for all ages and ability levels. The Rodeo includes target games, slalom, giant egg & spoon races, quoits &, limbo. For more details check out our e-leaflet here or email us for a personalised quotation. We can organise a gourmet picnic via our sister company The Tea Junction and our Rodeo venue even has presentation and classroom facilities if you want to delivery training and make a day out of it. Why not treat your staff to an unforgettable and unique team building experience in one of the Islands plantations, or whisk them along Douglas Promenade in a cool and entertaining way. If you are planning an event and wish to have some Segways present we will do our best to oblige assuming we have no prior commitments. Want to sponsor a Segway? There's no doubt that the Segway is cool and has a high visual impact. People just can't help but stare when they see people riding Segways. Imagine your Company name and branding attached to a Segway. Please call or email for further details.